Congratulations to "LS", the winner of Loren's giveaway. Thank you to all who participated! I’m Loren Mathis and I’m a new romantic suspense author. I grew up in a rural town in eastern NC. I went to college at UNC. I started writing my first novel, Pushed to the Edge, during my last year of law school. I came up with the idea for Pushed to the Edge during a Public Health Law course where I did a research project on the dangers of bioterrorism. Earlier in the year, the New York Times had posted an article about the U.S. government’s stockpiling of smallpox vaccines, and I thought that a rogue terrorist cell on the search for smallpox would make for an interesting read. When reading Pushed to the Edge, I hope that readers take away thoughts about the interconnection between terrorism and the drug trade. In addition to the suspense plot line, the key romantic plot thread involves Joshua Laurent and Victoria Sanchez. When penning the lead characters’ relationship, I wanted it to be as realistic as possible. Given the unique strain that is placed on military couples, I wanted to convey the toll that both the physical and emotional distance had on Joshua and Victoria’s relationship. “Joshua, please,” Victoria said, twisting a long strand of her hair in her fingers, biting her lower lip nervously. He still wasn’t looking at her, so Victoria walked over to his bed. She sat down right beside the open suitcase that he was filling up. “Joshua, I’m sorry. I’m sorry for dragging you into this with me,” she said looking at him. She was sure that her eyes were pleading with him at this point—for what, she didn’t know. Finally, Joshua’s eyes met hers. Victoria didn’t know what else to do. What else could she say to him? To make him understand how she felt. Well, maybe she could start with the truth. “Joshua, I never meant to hurt you before. I . . .” she trailed off and Joshua looked down into her eyes from where he stood at the foot of the bed, holding her gaze. “Scared of what?” Joshua stood there looking down at her. “I didn’t want to get a knock on my door someday from Will or Malcolm telling me that you had been killed. That you weren’t coming back home to me,” she finally answered, tears pooling in her eyes. 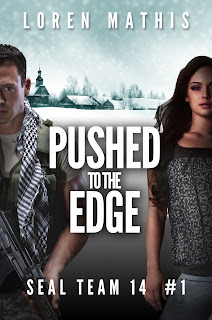 GIVEAWAY NOTICE - Comment for your chance to win a free copy of PUSHED TO THE EDGE! Giveaway ends 11:59pm EST Aug. 27th. Please supply your email in the post. You may use spaces or full text for security. (ex. jsmith at gmail dot com) If you do not wish to supply your email, or have trouble posting, please email maureen@JustRomanticSuspense.com with a subject title of JRS GIVEAWAY to be entered in the current giveaway. Nice to "Meet" you!! :) Your book looks really great, I will add it to my list!! Thanks for your comment, Sue! I had a fun time writing Pushed, and I hope that you enjoy reading it! Thanks for dropping by, Sally! I hope that you enjoy reading about the characters that I created in Pushed. Hello to a fellow Carolinian (I'm in Greensboro)! You kind of had me at Navy SEAL:) Good luck with your writing career and I'll be checking out Pushed to the Edge. Thank you for your comment, Jonetta! It's great to hear from a fellow North Carolinian! My sister went to UNC-Greensboro for college, so the Spartans are another staple in my family. I hope that you enjoy reading Pushed! Thanks for stopping by, Cris! Congratulations on your doctorate, that's an awesome accomplishment! I hope that you enjoy reading Pushed to the Edge. Congratulations on your first novel Loren. PUSHED TO THE EDGE sounds very exiting. Thanks for your comment, Mary! I hope that you enjoy my novel. Pushed to the Edge would be my type of book to read. It's kind of funny that I'm in forensic and my sister is in biochemistry. The book just reminds me of me and my sister. Yes, we do get into huge debates about certain things in our career. Thanks for your comment, Kai! It's interesting that you and your sister are in complementary fields. I hope that you enjoy Pushed! Thank you for your support and encouragement! Good luck in the giveaway, and I hope that you enjoy Pushed! It looks like a very timely story which is interesting to me. I do enjoy stories that relate to recent headlines. Thank you for dropping by, Maureen! I hope that you enjoy reading my novel.